Actor George Takei has taken on the task of clearing the name of a woman many believe to be a traitor -- Iva Toguri, better known as "Tokyo Rose." While it's been "light years" since George Takei took the helm of the USS Enterprise in "Star Trek," the veteran Japanese-American actor is still interested in taking audiences "where no man has gone before." But in this case he's doing it in the role of a film's executive producer, working on a project that's been dear to his heart for many years. It's one that could benefit Hawaii in the near future. His independent film is titled "Tokyo Rose: American Patriot." "It's an arresting title, isn't it?" he says in his familiar baritone. "It's meant to be because Tokyo Rose has always been thought of as a traitor, a propagandist, and some have even suggested a spy," during the U.S.-Japan conflict in the Pacific theater of World War II. "For the last year, whenever I've asked people what comes to mind when I mention the name of Tokyo Rose, those words have constantly come up. The woman who was subsequently accused as being Tokyo Rose, Iva Toguri, was tried and convicted, with banner headlines in newspapers across the country back then. "And when she was finally pardoned decades later, the story usually warranted only about a couple of inches in the papers." Takei, a member of the board of directors of the Japanese American National Museum in Los Angeles, and whose family was interned first in Arkansas and then Tule Lake, Calif., draws on injustices suffered on a personal and sociopolitical level in his campaign to tell the true story of Tokyo Rose. "It's a compelling mission for me," he says. "Iva is still alive and living in Chicago. I met back her back in the '70s, and I've been kind of nurturing this project for some time. I believe the best way for Iva to clear her name is with a theatrical feature film." Takei is in town trying to secure the remaining funding from potential local investors for his budgeted $5.5 million film. If all goes according to plan, he wants Oahu to serve as a main shooting location beginning in the summer. "Iva Toguri is a woman accused of treason, tried and found guilty in one of the most egregious cases of American injustice, in a climate inflamed by media hysteria," Takei says. "Hers is a powerful, moving and dramatic story -- one that I think most Asian Americans are not aware of." Geroge Takei says Iva Toguri was a convenient scapegoat after the war. Ikuki Toguri, born in L.A. on the 4th of July, 1916, took the first name of Iva went she went to school. After obtaining a degree in zoology from the University of California at Los Angeles and helping her father with his business, she sailed to Japan in July of 1941 to visit a sick aunt and to study medicine. But after Pearl Harbor was attacked by the Japanese five months later, she reportedly decided to stay in Japan, even though she had tried to return to the U.S. before war broke out between the two countries. In August of '43, Toguri found work as a Radio Tokyo typist and, two months later, began her broadcast career, as written on the FBI's Web site, as "part of (the) Japanese psychological warfare designed to lower the morale of the United States Armed Forces." But she reportedly did not give herself the on-air moniker of Tokyo Rose. The Web site reports that the name "was applied by United States Armed Forces personnel in the South Pacific area to any of a number of English-speaking Japanese women broadcasting over Radio Tokyo between 1943 and 1945." Takei said there were at least a half dozen others who could've been characterized as Tokyo Rose, but after Japan's surrender, "those other women disappeared into the woodwork." His film will be richer in personal detail and probably at odds with America's written history. "She was an incredibly courageous woman," Takei said. "She took great personal risk smuggling food to American POWs and an Australian journalist, both of whom were brought into Radio Tokyo because of their previous broadcast experience. "They were able to sell their Japanese bosses on satire and I feel their agenda undercut the propagandists." Takei said Toguri's broadcast career wasn't a result of a subversive nature. "She was found in the typing pool, and far from having a seductive, temptress voice, she had a very dominating, commanding voice. That's why she was selected. "Her personal story in Japan is incredibly dramatic and gripping. She was living alone in Japan and spoke the language poorly, so she felt alienated. Iva was the one who had to go and help her ill aunt because her mother was too sick to go herself. And when war broke out with the U.S., she felt she would be a liability if she went back, with the Japanese secret police hanging out near her." IN APRIL OF 1945, Toguri met a Eurasian man, Felipe D'Aquino, who was half-Portuguese and half-Japanese, raised in Japan, and a fluent English speaker. They fell in love and married. "It's a touching love story, partly because they lost their baby due to malnutrition," Takei said. After the war, there was a great media rush to get the story on Tokyo Rose, with an outraged American public accusing her of treason. "Iva was the one conveniently picked out by the U.S. Army -- the other women were just as culpable, but they disappeared. "When Iva was first tried in a military court in Tokyo, she was found not guilty. But it was only after she returned to the mainland that the case became inflamed when the influential newspaper and radio columnist Walter Winchell took up the cudgel, so to speak, and accused President Harry Truman of being soft on traitors. The Japanese Americans were thought of as pariahs anyway, so the climate surrounding her case became even more inflamed." Takei says the real villain was a man named Harry Brundage. "He was the earliest American journalist to rush into Tokyo after the war. He met Iva at the Imperial Hotel, where he paid her the then-large sum of $2,000 on condition that she sign a paper claiming, unbeknownst to her, in the last paragraph that she was Tokyo Rose. "It was that foolish act of desperation that got her in trouble." But Toguri remains a hero to Takei, who also admires Wayne Collins, a colorful Irish-American civil rights attorney in San Francisco who defended Toguri the day after her 33rd birthday in 1949. "He's one of my personal heroes, because no other attorneys would touch Japanese-American cases in the post-war era," Takei said. "He also defended JA resisters, who weren't allowed to leave the internment camps, so they could report to their hometown draft boards as Americans. "Even though Iva was found guilty of treason, Collins was still a powerful, courageous and principled man." 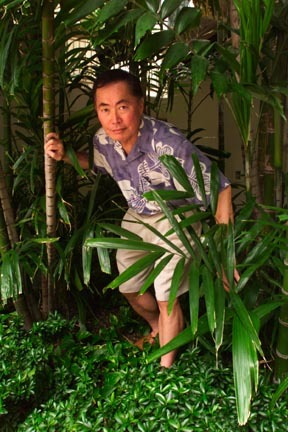 TAKEI PITCHES his "Tokyo Rose: American Patriot" with a confident fervor. "The actors who play the roles of Wayne Collins and Iva Toguri are crucial to the success of this film. The script has already been read by Martin Sheen, who plays the president in 'The West Wing' -- and that TV show's audience is the very one we're targeting this film to. "We're mindful of the fact that we only have a $5.5 million production budget, and no negotiations with actors will happen until our investors are all in." He does say he has a couple of actresses in mind for the part of Toguri. "Iva and Wayne are two very rich roles, and if the actors do any justice to the roles, I'm sure they would be in contention for Academy Awards," says Takei, who bases his confidence of the successes of similarly budgeted films "The Pianist" and "Monster," which garnered Oscars for lead actors Adrien Brody and Charlize Theron. Takei has hired veteran director Terry Sanders to helm the film (also one of a trio of writers that wrote the script) and "is confident he can deliver a distinguished film on a tight budget." 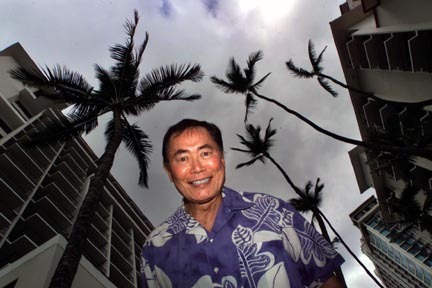 Like other previous film and television projects that have recently used Hawaii as a location, Takei is hoping to take advantage of the Act 221 tax incentive to do the bulk of the filming of "Tokyo Rose: American Patriot" here. "While it's been portrayed as a two-edged sword of late, I think this film will be of tremendous benefit to the state. We intend to spend around $4 million here in Hawaii, doing pre-production, filming and post-production here. We will be creating high-paying jobs, buying products and services here, renting a lot of equipment and facilities, and paying taxes. "Hawaii can be very attractive to Hollywood. It has a great diversity of settings; you do have the infrastructure and personnel here, and it's a wonderful place to come. But there needs to be a genuine film industry, rather than a series of one-shots, so well-paying jobs can be created here." Although location shooting will be partly done in Japan, Takei says everything else -- Japanese and American exterior and interior scenes -- will be shot here. Takei projects that once the film is released "it will generate a lot of stories that will be so contrary to former public opinion. "I also envision a premiere that President Ford will attend. I definitely want to bring Iva in from Chicago for that occasion."